Posted May 14, 2018 by Eds. 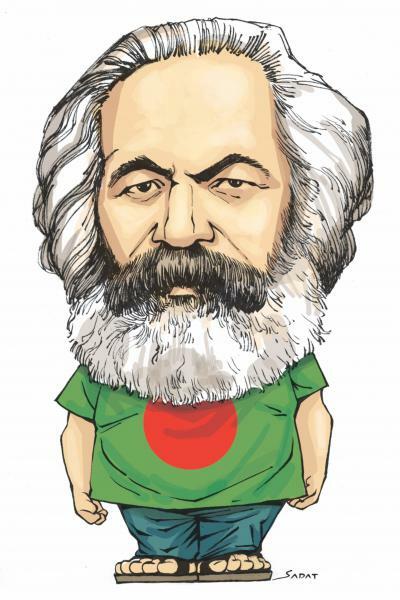 No I am not talking about my encounter with the ghost of Karl Marx in Bangladesh. If you are interested in such stories you should read Howard Zinn’s Marx in Soho or Sumonto Bandyopadhyay’s Bhuture Molakat (Ghostly Encounter)—two hilarious and, at the same time, intellectually erudite accounts of meeting the ghost of Marx in New York and Kolkata, respectively. Rather, what I am going to narrate here is the intellectual or conceptual footprints of Marx in Bangladesh—how his ideas travelled within the elite academia, the intellectual discourses and middle class political activism as well as the ordinary people and peasantries in remote villages in colonial Bengal and independent Bangladesh. I must warn the reader that the following account is not based on any systematic research but relies on what I have read, seen, and experienced over the decades. Clearly this is not an exhaustive survey of the topic. Sumonto Bandyopadhyay noted that the prominent intellectuals of colonial Bengal, who were contemporaries of Marx and were interested and wrote about the conditions of workers and peasantry and their struggles, didn’t seem to show any awareness of Marx and the name never showed up in their relevant writings. These would include Prince Dwarkanath Tagore (grandfather of Rabindranath Tagore, who witnessed, first hand, the famous Chartist movement in London and wrote about it), Shibnath Shastri (who might have written a letter, in 1871, to the International Working Men’s Association-headed by Karl Marx—to set up a branch in India), and young Bankim Chandra Chattopadhya (who showed great sympathy for the peasantry in his essay “Shamya”, meaning “equality”). As it turned out, to enter the intellectual realm of the Indian subcontinent, Marx had to wait for the Russian Revolution. The two pioneers of Marxist intellectualism in Bengal (and possibly in entire India) were Bhupendranath Dutta (younger brother of Swami Vivekananda) and Manabendranath Roy (famously known as MN Roy and the founder of both Mexican and Indian Communist Parties). They both met Lenin in Russia (in 1921) and were inspired by him to initiate Marxist analysis of Indian politics, society and economy. If I have to zoom in to the contributions of East Bengalis to Bengal Marxism, the first name that comes to mind is comrade Muzaffar Ahmad—one of the founders of Communist Party in undivided India. He was born in Swandip of Noakhali in 1889. When and how did he first come in contact with Marx’s ideas? As he recollected in his memoirs, with great effort he managed to collect Taka 10, and with that he bought four books—one of these was People’s Marx: Abridged popular edition of “Capital”. This was in the November of 1921. Although proto-socialist ideas, even Bolshevism (as the de facto expression of the Muslim subaltern discourse of resistance against the ideological hegemony of colonial masters and native Hindu elites) informed different journals and magazines with which comrade Muzaffar Ahmad was associated, it was only in Langol (Plough) and then Ganobani (Statement of the People) where explicit uses of Marx and Marxist ideas can be seen. Langol was published in 1925 and the name was changed to Ganobani in late 1926. These were de facto edited and managed by comrade Muzaffar Ahmad and its Prodhan Porichalok (Principal Director) was the rebel poet Kazi Nazrul Islam. The first essay on Marx published in Langol was by Debabrata Basu (titled “Karl Marx”, in 1925) followed by an essay by Kutubuddin Ahmad (titled “Karl Marx-er Siksha” or “Teachings of Karl Marx”, in 1925)—perhaps the first ever essay on Marx written by a Muslim in Bengali. The first translation of Marx’s own writing (a letter written on India in 1853 that was sent to New York Tribune) was published in the number 12 issue of Langol in 1926. This could possibly be the first ever writing of Marx translated in Bengali. Did Poet Nazrul read Marx? Can many of his poems and essays published in Langol and Ganobani be considered “Marxist”? In response to the first question, historian Neilesh Bose’s (who wrote a book on Bengal Muslim intellectual discourse of this period) not so confident answer is: “…it is unlikely that he did”. He also observes that he finds “…a curious convergence” between Poet Nazrul and Marx in analysing religious bigotry. I find his observation a bit odd since being the Prodhan Porichalok of a journal that published articles on and by Marx, is it logical to assume that Poet Nazrul will miss reading Marx in the original, given his voracious reading habit? Let’s not quibble over this any further. One thing can be safely assumed: Nazrul was heavily tutored on Marx’s ideas by his friend comrade Muzaffar Ahmad and during the Langol and Ganobani period, his creative expressions tended to manifest various core ideas of Marx—both economic and social. As to the question whether his writings can be considered “Marxist”, take the poem Kuli-Mujur (Coolies and Labourers). I also find Poet Nazrul’s contribution in the two journals to be strategic. I would call it a “national popular” strategic discourse, an idea that was almost simultaneously developed by the great Italian Marxist philosopher Antonio Gramsci. To put it very simply, this is the idea that the subaltern classes (i.e., of lower ranks) need to develop their own ideology to counter the hegemonic ideas of the elites that tend to influence and control their thoughts and world-views. Poet Nazrul, by brilliantly deploying popular emotional idioms in his creative works, published in these two journals, acted as a de facto organic intellectual of the subalterns in the colonial context. Comrade Muzaffar Ahmad targeted the intellect of the readers (with copious references to Marx and Lenin and other radicals) and Poet Nazrul aimed at their hearts (no references used even in his essays)—thereby, the two editors successfully struck an optimum balance in their counter hegemonic discursive assaults on the ideologies of the colonial elites—both Western and native. But, the person who can take the major credit for popularising Marx’s ideas among thousands of communist activists in Bengal over many decades is Reboti Barman. Born in a remote village of Mymensingh district, he studied in a local school and secured the first position in the entrance exam in the entire Bengal (in 1922). Later he studied economics at Calcutta (Kolkata) University and passed the MA exam with distinction and was awarded a gold medal. With such a distinguished academic achievement he could have easily entered the ICS cadre—a highly coveted job in colonial Bengal, or could have become a professor in any elite university. Rather, he chose to be a political activist and fight for the freedom of his country. He was the first person in undivided India who translated Marx’s Capital (abridged version) in a local language (Bengali, in 1939). He also wrote several other primers on Marxism, which were published by Gonoshahitya Chakra (People’s Literature Circle), a publishing house established by him in Dhaka in 1938. In the introduction to his translated Capital, he wrote “Capital is very difficult to understand (durbodhdho) and it is very long (brihot)—but it should not be avoided by the revolutionaries and true seekers of knowledge for these reasons”. As a Bangladeshi left political leader of national stature told me recently, it was through the writings of Reboti Barman that many left activists of the country got their initial understanding of Marx and socialism.